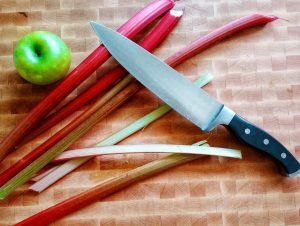 Rhubarb. That majestic, mysterious plant with the larger than life leaves. Somehow it has the energy to endure the trauma that is my garden. My thumbs are not green, yet somehow the rhubarb stands strong- fighting through even the fiercest of droughts. This year I’ve offered my garden water. Now, not to brag or anything…but even the basil and strawberries live on! My Rhubarb has gone from “survive” to “thrive”, and I now have more than a single recipe’s worth. Call me crazy, but I’m not actually a fan of a crumb topped muffin. The crumb that starts off so pretty gets soggy in a day- and its more ammo for disaster when fed to the tiny humans. Plus, it’s an extra step. Ain’t nobody got time for that. 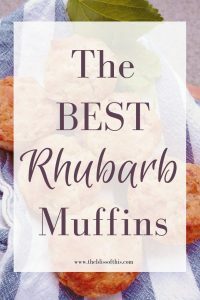 But the perfect Rhubarb crumb-top-free muffin isn’t easy to find. 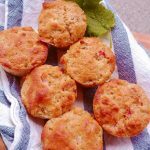 Either they are too crumbly, too dry, or just too boring. You might notice my pretty purple muffin tins. They are actually food grade silicone! These things are the answer to every baker’s muffin liner dilemmas. 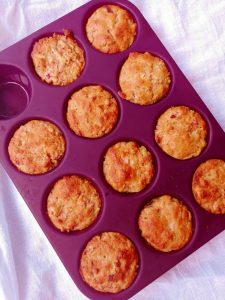 How often have you run out of muffin liners- those white little papers that stick to your muffins and get tossed in the garbage moments after baking. Seems a bit silly, amiright?! 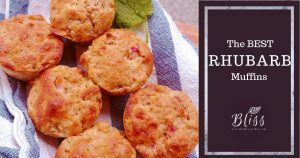 These bad boys fit right on your cookie sheet, and when the muffins are ready they pop right out! Best part? They are dishwasher safe. Ok. Back to the muffins. Delicious and yummy…get into my tummy. The recipe itself is quite simple. Like any other muffin recipe there’s no need for a mixer- just two pretty bowls and a spoon. With this much rhubarb to spare, I plan to freeze rhubarb. If you love this recipe, freeze your stalks in 2 cup portions so you can skip the measuring. Try them out- I’d love to hear what you think! Not a fan of scooping batter? Me neither… when I post pictures of my kids scooping batter, it’s really not because I’m the patient Mom I try to be. Really, it’s because it’s a job they are far more into than I am. But when those helpers are out and about, I’m stuck to do the job myself. I love my muffin scoop to get the job done faster!